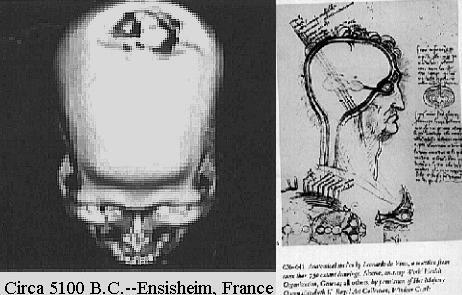 Evidences of Skulls with Brain surgery or Trepanation between 7000 BCE – 1400 CE found in Europe, South America, Egypt, India. Bhoja Prabandham written by Raja Bhoj of Paramar around 1050 CE describes its process. Brain surgery or Trepanation is one of the oldest of the practiced medical arts. Remains of successful brain operations, as well as surgical implements, were found in France at one of Europe’s noted archeological digs. Success rate was remarkable, even circa 7,000 BCE. Even around 5100 BCE, brain surgeries were done and evidences were found in France. However, Trepanation was not limited to europe alone. Africa has evidence of brain surgery as early as 3,000 BCE in papyrus writings found in Egypt. “Brain,” the actual word itself, is used here for the first time in any language. Egyptian knowledge of anatomy may have been rudimentary, but the ancient civilization did contribute important notations on the nervous system. Around 2000 BCE in Paracas, Peru, a desert strip south of Lima, archeologic evidence indicates that brain surgery was used extensively. Here, too, an inordinate success rate was noted as patients were restored to health. The treatment was used for mental illnesses, epilepsy, headaches, organic diseases, neuropathy treatment, osteomylitis, and for head injuries. Brain surgery was also used for both spiritual and magical reasons; often, the practice was limited to kings, priests and the nobility. Surgical tools found in South America were made of both bronze and shaped obsidian (a hard, sharp-edged volcanic rock). 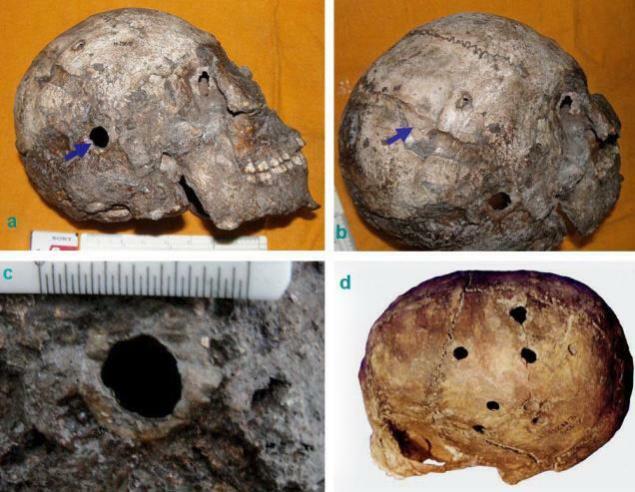 A Neolithic skull from Burzahom 1–3 in the Kashmir Valley was reported with multiple trepanations as the first case from the Indian subcontinent. This skull dates back to 2300 BCE and was from Harappan Civilization. In Some parts of the world, This procedure has also been associated with religious rituals and “to ward off evil spirits”. However, in the case of the skull that was found in Harappa, The Trepanation (process of cutting a hole in the skull) was intended as therapeutic as there is a clear indication of cranial trauma in the form of a visible linear depression, probably resulting from a severe blow. There is evidence of healing, indicating that the victim survived for a considerable time after the surgery. Scholars have recorded striking similarities in trepanation techniques across the continents, and therefore considered it as important evidence for prehistoric movements of people and for transfer of surgical skills from one society to another. Hippocrates, left many texts on brain surgery. Born in 470 BCE, Hippocrates was quite familiar with the clinical signs of head injuries. He also described seizures accurately, as well as spasms and head contusions, fractures and depressions. Many concepts found in his texts were still in good stead two thousand years after his death in 360 BCE. Ancient Rome in the first century CE had its brain surgeon star, Aulus Cornelius Celsus. He also described the symptoms of brain injury in great detail. Sushruta (around 600 BCE) performed many surgeries, including Rhinoplasty (Plastic Surgery), cataract, eye, nose, ear, skull, abdomen, limbs etc. There is another reference to Brain surgery in 11th century in a text Bhoja Prabandham, describing life of Raja Bhoja of Paramar dynasty (who wrote Samarangana Sutradhara). Just before he came to power, Bhoja was afflicted by a tumor in his brain which used to cause him intense headaches. Two Brahmin brothers from the school of Ujjain, who were pre-eminent surgeons of the era, performed a surgery on his brain and relieved him of his tumor. The description of the surgery as mentioned in the reference suggests that they artificially induced a coma with a special preparation known as the Sammohini (anesthesia) and then opened his skull to remove the tumor. He was then brought back to consciousness with another drug. During later years, in Asia, Galenus of Pergamon, born in Turkey, and the physicians of Byzance such as Oribasius (4th century) and Paul of Aegina. An Islamic school of brain surgery also flourished from 800 to 1200 CE. Abu Bekr Muhammed el Razi, who lived from 852 to 932 CE was perhaps the greatest of Islamic brain srugeons. A second Islamic brain surgeon, Abu l’Qluasim Khalaf, lived and practiced in Cordoba, Spain, and was one of the great influences on western brain surgery. Also, Leonardo Davinci’s portfolio containing hundreds of accurate anatomical sketches indicates the intense intellectual interest in the workings of the human body during his era.